MONTPELIER – Vermont Governor Phil Scott has reportedly asked the state to organize a military show-of-force that would emphasize his supreme gubernatorial power, and insists that this fragile display of ego-stroking be as similar as possible to the Montreal St. Patrick’s Day Parade, which Scott once called “one of the greatest parades” he had ever seen. Vermont is not known globally as a military power, but Scott hopes to change all that using one thing that the state is known for: the color green. 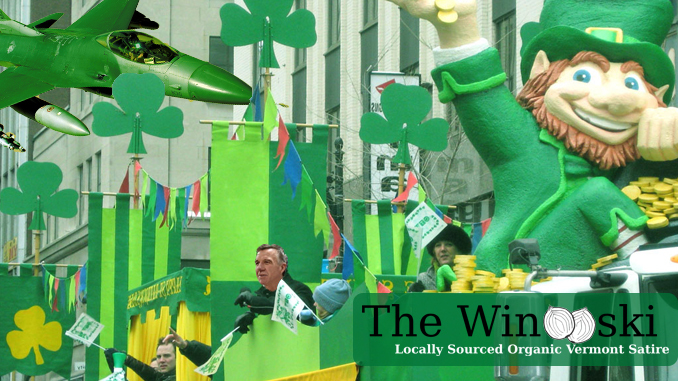 According to sources inside the statehouse, preliminary parade plans would include use of the fighter jets stationed in South Burlington, as well as the tanks of the 86th Infantry Brigade Combat Team, all of which would be painted bright green for the event. The parade route will be made available once final details have been hammered out. Your creativity continues to shine.